I’m currently making Vogue 1073, a pattern that’s well out of my comfort zone. The obviously awkward feature in it is the curved pintucks, although no doubt there are others that I’ll discover later on. The pattern instructions say something along the lines of ‘to make pintucks, fold along the marked line and sew close to folded edge’. Perfectly accurate but light on detail. So I spent an evening sewing pintucks in scraps of my fashion fabric in various different ways to try to find a way to do it neatly. This is what worked best for me. My fabric is a viscose doubleknit – or perhaps it’s an interlock as I’m not quite sure of the difference between the two. Anyway it’s a beefy knit with no obvious right and wrong side. I’m sewing it with a stretch needle and a looser than normal needle tension as my machine tends to skip stitches on this fabric. I start off by hand basting along the tuck with a long running stitch so I can see it from the right side of the fabric. Unfortunately the pictures that follow are a mixture of two different tucks with slightly different shapes because I kept forgetting to take photos as I went. It’s easier to sew the tuck with the inside edge of the curve on top of the work, so the side where the fabric bunches up is on the bottom. This seems counter-intuitive to me but it really did work better that way round. 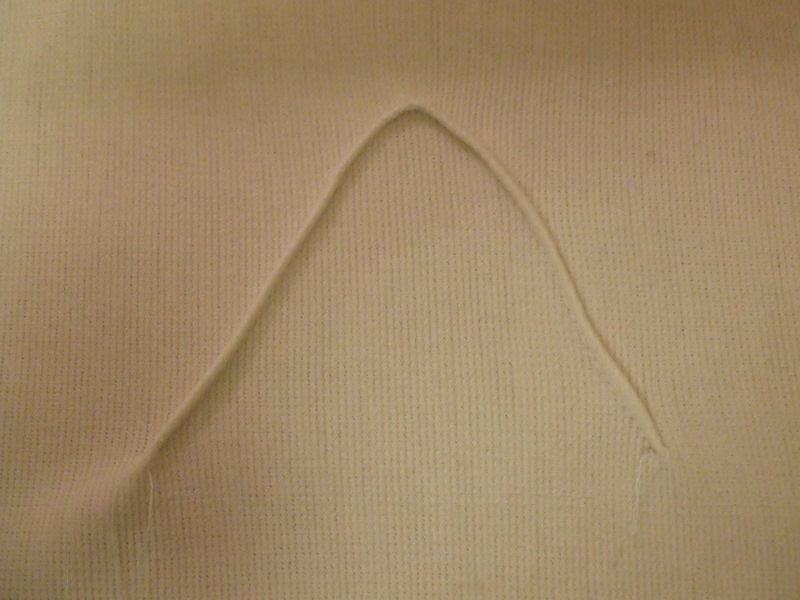 It’s also easier to be neat if you keep the tuck very small – mine are a scant 1/8 of an inch. 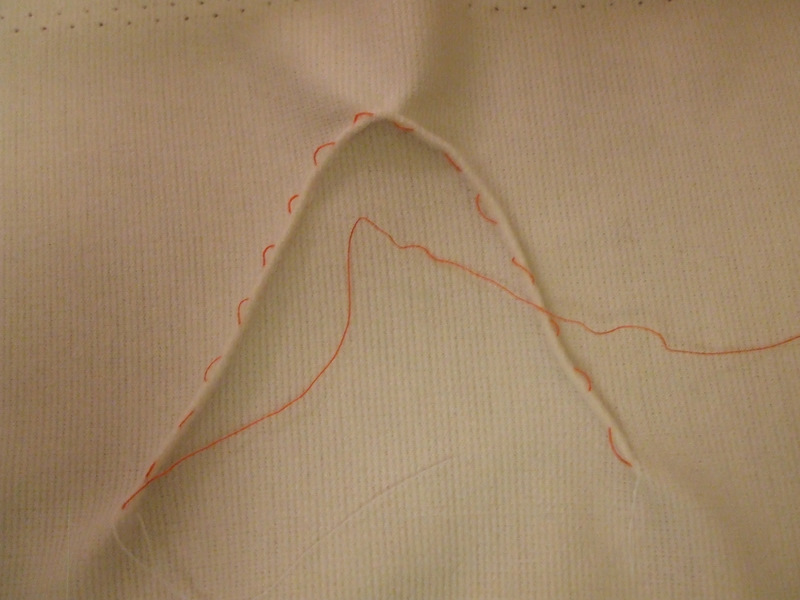 Fold along the line of basting (wrong sides together) and sew along the line. 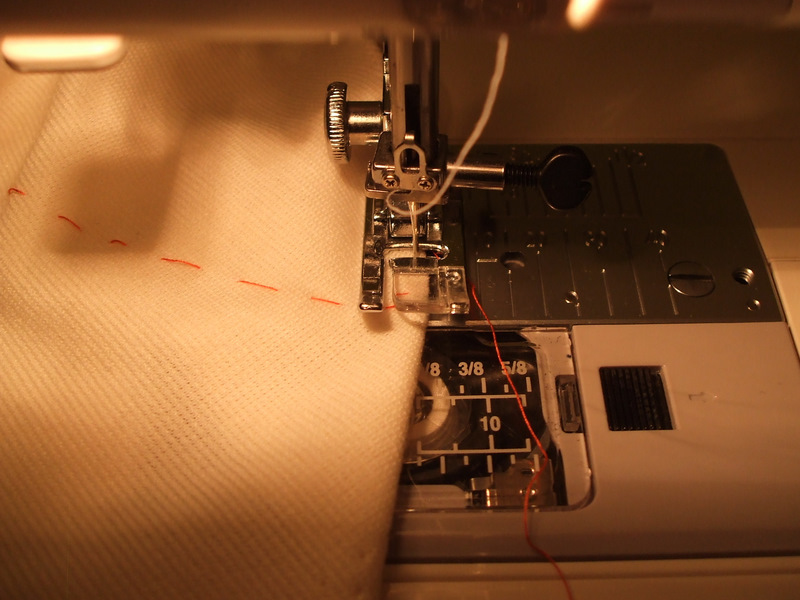 When you get to the sharp curve, stop every few stitches with the needle in the fabric, lift the presser foot, and rearrange the fabric under the foot to avoid sewing any wrinkles in. It’s a bit difficult to see what’s going on and it feels like the needle’s about to fall off the edge of the fabric all the time. I had to resist the temptation to correct that as it just resulted in a wrinkly mess when I did. Once you’re done it looks a bit wrinkly. Pull out the basting and press, and it looks a whole lot better. And you can reuse the basting thread for the next one. The samples didn’t all come out right first time, but I found that it’s possible to recover a wrinkly one by unpicking the wrinkle and resewing that section. This probably depends on the fabric. Mine’s quite forgiving. Next stop, sewing the real thing. 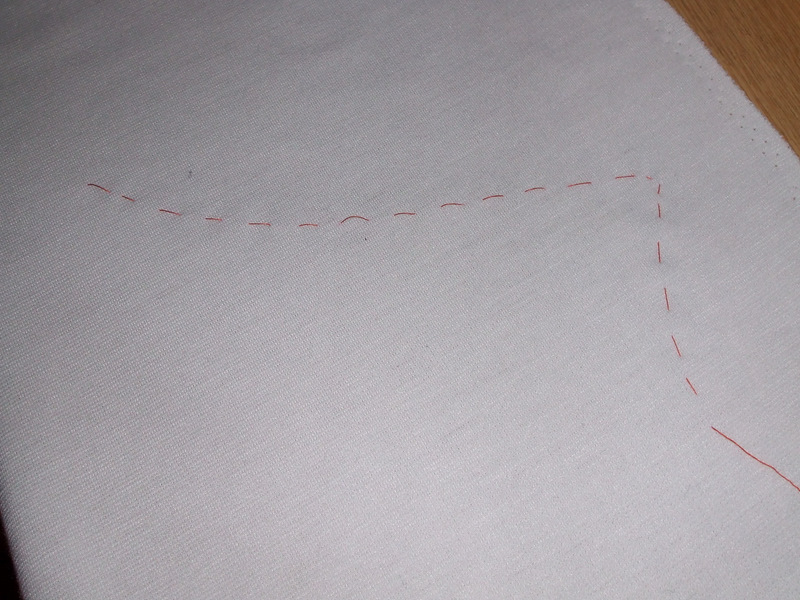 After I’ve cut out the interfacing and the lining, that is, which will be a job in itself. Posted on September 21, 2011 September 20, 2011 by catherinedaze	This entry was posted in dressmaking, sewing, Techniques, vogue, Vogue 1073 and tagged dressmaking, fabric, pintucks, sewing, vogue, white. Bookmark the permalink. Nice work! I’m looking forward to reading your progress reports on this dress. The tucks seem to be the most finicky thing in the pattern. Can’t wait to see a pic of the front once you’ve got the tucks done! Oooh this is so exciting. I’m glad you practiced a lot first. I can’t wait to see it. Please post in process pictures for the nerds out here. (that would be me.) haha! 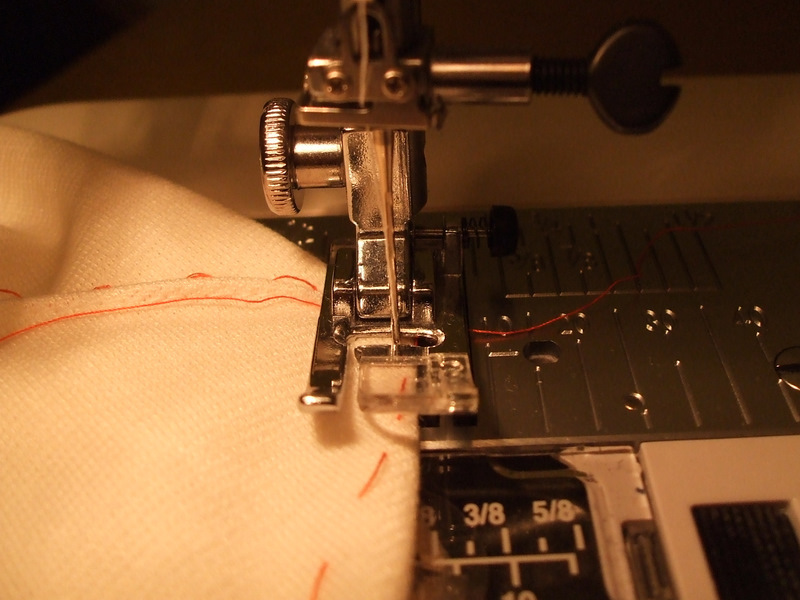 Thank you for going into detail about how to sew the tucks. I have been afraid of this pattern. Beautiful dress on you. I saw it on Pattern Review. Your detail on pin tucking is appreciated. Thank you.